City: * City name is required. State or Province: * Select State/Province --US States-- AK-Alaska AL-Alabama AR-Arkansas AZ-Arizona CA-California CO-Colorado CT-Connecticut DC-District of Columbia DE-Delaware FL-Florida GA-Georgia HI-Hawaii IA-Iowa ID-Idaho IL-Illinois IN-Indiana KS-Kansas KY-Kentucky LA-Louisiana MA-Massachusetts MD-Maryland ME-Maine MI-Michigan MN-Minnesota MO-Missouri MS-Mississippi MT-Montana NC-North Carolina ND-North Dakota NE-Nebraska NH-New Hampshire NJ-New Jersey NM-New Mexico NV-Nevada NY-New York OH-Ohio OK-Oklahoma OR-Oregon PA-Pennsylvania RI-Rhode Island SC-South Carolina SD-South Dakota TN-Tennessee TX-Texas UT-Utah VA-Virginia VT-Vermont WA-Washington WI-Wisconsin WV-West Virginia WY-Wyoming --US Territories-- AS-American Samoa FM-Micronesia GU-Guam MH-Marshall Islands MP-Northern Marianas PR-Puerto Rico PW-Palau VI-Virgin Island --Canadian Provinces-- AB-Alberta BC-British Columbia MB-Manitoba NB-New Brunswick NF-Newfoundland NS-Nova Scotia NT-Northwest Territory NU-Nunavut ON-Ontario PE-Prince Edward Island QC-Quebec SK-Saskatchewan YT-Yukon Territory --Mexican States-- AG-Aguascalientes BJ-Baja California BS-Baja California Sur CH-Chiapas CI-Chihuahua CL-Colima CP-Campeche CU-Coahuila DF-Distrito Federal DG-Durango EM-Mexico GJ-Guanajuato GR-Guerrero HG-Hidalgo JA-Jalisco MH-Michoacan MR-Morelos NA-Nayarit NL-Nuevo Leon OA-Oaxaca PU-Puebla QA-Queretaro QR-Quintana Roo SI-Sinaloa SL-San Luis Potosi SO-Sonora TA-Tabasco TL-Tlaxcala TM-Tamaulipas VZ-Veracruz YC-Yucatan ZT-Zacatecas Other Please select State/Province. Zip Code/Postal Code: * Zip code is required. Please Enter Valid Zip Code/Postal Code. Email Address: * Please enter valid email address. Please enter valid email address. Confirm E-mail address must be same as Email address. Which product are you registering? * Select A Product Type Garage Door Entry Door Please select product type. Looking for our garage door collections? View them here. The first three questions are required. The remaining questions are optional but we very much value your additional time in helping us understand your purchase journey. Please enter serial number. Where can i find my Serial # ? Click here. Who in your household made the purchasing decision for your new garage door? All remaining questions are optional but we very much value your additional time in helping us understand your purchase journey. Did you install or have someone install the garage door for you? Who in your household made the purchasing decision for your new entry door? Was this door purchased for new construction or remodel/replace? One last step! Please type in field below the text you see in image. This is used to make sure you are not spam. Thanks! 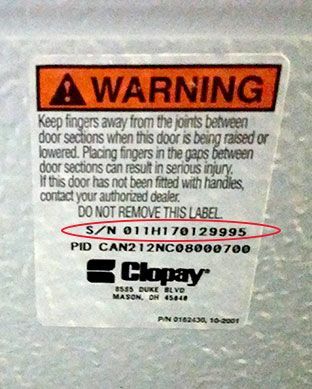 Look for the below label on the back of your garage door. The circled number labeled S/N is your serial number.